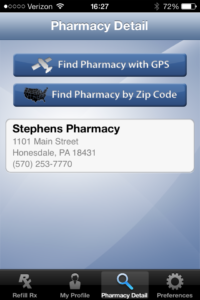 Rx 2 Go is a free application that helps connect you to your hometown independent Stephens Pharmacy. Use the pharmacy search feature to find Stephens Pharmacy and set it as your primary pharmacy. Once you have done that, you will be able to submit refill requests directly from your iPhone or Android Device. Additionally, Stephens Pharmacy has an online interface that offers even more features than the app. Sign up for your online account now! Refill requests submitted using the Rx 2 Go app or through the internet refill portal appear directly on our pharmacy computer screen! Completed refill availability varies and must be picked up in store. Rx 2 Go Mobile App F.A.Q. From where can I download the mobile app? Android Smartphone users can download from Google Play. iPhone Smartphone users can download from the App Store. How much does Rx2Go cost? Stephens Pharmacy will not charge you a fee when you utilize our Rx2Go service, however, Message and Data Rates may apply through your wireless carrier if you choose the text or e-mail alert services. Please make sure you understand the terms of your mobile agreement before taking advantage of these services. I have an online Rx Refill Account . I have downloaded the mobile app, now what do I do? Use the smartphone camera and align the Rx barcode between the guidelines on the screen.